Notions about the nature of self and world are undergoing a radical revisioning within philosophy, physics, and psychology. Current research suggests that a viable approach to understanding reality is that of parallel universes; human consciousness necessarily also consists of relative, multiple perspectives, or states of consciousness. We can refer to this fundamental notion of reality as the Multistate Paradigm. Science has traditionally been based on observation, predictability, and repeatability. In seeking nature's secrets, it has dived into the very heart of God. Philosophy is the dynamics of the search for God. Science is a natural philosophy, which is best served by following nature's lead. However, the basic foundations of science have been called into question by relativity, quantum mechanics, and chaos theory. Science has been "interpreting" rather than witnessing nature. Quantum mechanics and relativity theory inform us that there is no objective observer, because the process of observation changes the state of that which is observed, as well as the observer. The observer is, in fact, always a participant in the process. Quantum processes are inherently indeterminate, probabilistic, fuzzy, cloudy. Quantum entities appear to inhabit a myriad of states until a direct observation or measurement is performed by an "observer." Under observation, quantum processes appear to "leap" into one of the possible states--the so-called quantum leap. We can appear to make a quantum leap in consciousness by altering our point-of-view through empathic identification with other aspects of ourselves than the ego's point-of-view. We have the capacity to experience reality from multiple states of consciousness. Mystics speak of a relative point-of-view which is rooted beyond the personality. In eastern mysticism, it is the Witness or Observer Self, which dispassionately surveys the experience of the person from a higher spiritual perspective. It is essentially objective with respect to the ordinary personality, pure attention or awareness with no judgmental characteristics. It simply notes what's happening. It is interesting in the transition period between two states of consciousness, radical destructuring, which technically eliminates the ability to observe. Then there is blankness--no direct experiential observation of the transitional period--blackout. If destructuring is not total, then limited or incomplete descriptions emerge. However, an observer self may maintain awareness through the help of a guide or identification with other structures, i.e. the therapeutic process. In western mysticism, it is the "I" of the "I-Self" or "I-Thou" dialogical realm. An "observer" implies a split from the system observed--it is objectifed. In Unitive states, this "I" merges with the "object" of contemplation and duality is superseded. The unitive state is characterized as the Clear Light of the Void. In science, the observer is usually taken for granted, yet we have the phenomenon of "observer bias," the unconscious bias of the investigator. Observations are mixed with evaluations. We know that this tends to skew the results of inquiry in the direction of tacit expectations. For example, a parapsychologist who is a "true believer" tends to "find" whatever psychic phenomena he is looking for. The root of the word theory means "to see." We can create a reality for ourselves, a predisposition to "see" what we "believe" we will find. The more passionate the belief, the more likely the outcome. Furthermore we tend to "see" it in the metaphors with which we are enculturated. It is a matter of "I wouldn't have seen it if I hadn't believed it." Thus those in a religious milieu generally experience God in their "approved" local form. Even the Witness as point-of-view carries its positional bias of spiritual orientation. It is rooted in the belief system, one of the primary "filters" of direct experience. Its advantage as a perspective lies in the fact, that since it is not identified with the ego/personality, it provides an observational point from which to view ego's dissolution. Thus, it is a "vehicle" for transcendence of ordinary awareness. Whether we are speaking physics or mysticism, apparently we are ultimately describing the observation of internal states (Tart, 1975), i.e. some form of introspection. Virtually all that can be observed is some form of image, whether it is an image of self, or world, or God. The congealed potential of such imagery can appear as a fog, cloudiness, amorphous generalized grayness without distinct features. We can speculate that this cloudiness represents the diffuse, undifferentiated imagery of all potential imagery: all self-images, all nature-images, all God-images. Tart has used people's reports of their internal experiences in developing a systems approach to discrete states of consciousness (d-SoCs), "even though these reports are undoubtedly affected by a variety of biases, limitations, and inadequacies." They are nevertheless the most relevant data for studying states of consciousness. According to Tart it cannot be known to what extent, "the Observer's apparent objectivity is a reality and to what extent a fiction." If Tart alleged we could know, we would have to suspect his investigator's bias! When experiential data are used to understand states of consciousness, the observation process cannot be taken for granted. But neither does it need to be interpreted. There is a 14th century text, known as THE CLOUD OF UNKNOWING, which is a classic of mystical literature. Its purpose was to provide practical advice for all individuals interested in achieving a direct knowledge of God that they might verify their own experience (Progoff, 1957). This contact with God was not understood as something transcendent or removed from daily life, but was sought as a content of immediate experience. Reminiscent of THE CLOUD OF UNKNOWING, the "many worlds" interpretation of quantum mechanics (Everett) informs us that we live in a cloud of positional universes. This interpretation of parallel universes emerges from the mathematical reconciliation of relativity theory with quantum mechanics. 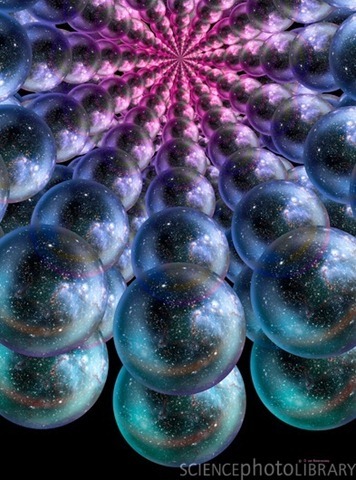 Both predict that the deeper nature of reality is this "Multiverse." This (amorphous) cloud of infinity veils the true face of God. Mystics are more interested in the "heart of God" where they approach without interpretation, quantification, objectification, etc. The whole universe is connected through the existence of all parallel universes. Each and every atom in our brains and bodies are connected to each and every atom everywhere, particularly the local parallel universes that immediately surround it. Those universes make up its electron wave cloud. As long as no attempt is made to discern where the electron actually is, it is present in all of these universes simultaneously. These universes overlap, producing the single universe containing a stable atom (Wolf, 1988). Any one universe is composed of virtually an infinite number of potential or unobserved overlapping parallel universes so long as no resolution or observation is attempted. In this manner the whole range of unobserved phenomena represents a completely undivided universe. The many-worlds interpretation is consistent with cosmology, relativity theory, quantum mechanics, and perhaps psychology. In this interpretation, matter exists in all the parallel universes as "parallel ghosts." It is not the conventional, nor conservative interpretation of QM (the Copenhagen Interpretation), but it is the only one which accounts for certain phenomena. These parallel universes are all necessary to create the stable universe we inhabit. On the atomic scale, single electrons exist as clouds within atoms so they have stable energy. The Uncertainty Principle assures us we can never know its position and dynamics simultaneously. Infinite possibilities appear as a "smear"--that cloudiness. It implies that according to quantum rules, we can never know and experience simultaneously all that is in principle knowable, hence the "cloud of unknowing." Nature generates infinities of possibilities which veil the face of God. It is a self-referential process. These self-generated, self-reflective infinities only create uncertainty (indeterminacy; unpredictability based on cause/effect) when viewed from a certain perspective--that of a single observer in a single universe. Parallel worlds emerge when we consider multiple observers making multiple observations (relative perspectives). We too are composed of the stuff of infinity, and our consciousness creates and alters what we observe. The very act of observation changes ourselves. We become part of the process by becoming involved with it--the observer becomes part of the wave. Consciousness is a pattern of order in superspace, created by the overlapping of fleeting flashes of energy, which creates mind and matter. Therefore, the existence of matter and the perception of it are the same thing (Wolf, 1988). In the parallel worlds interpretation of quantum mechanics there are no quantum jumps--just continuous transformation. Mother Nature branches into infinity, through branches of possibilities from a central trunk of initial conditions into a universe of all possible universes (Wolf, 1988). This is the "Tree of Life," which fills all-space, all-time, all dimensions, like a fractal generator. This Tree functions as an algorithm of existence. There is evidence now that the seemingly indeterminate world of quantum physics is undergird with an inherently unpredictable, yet deterministic matrix of chaotic flux. The emergent creative order within randomness is so ethereal it has been virtually invisible (therefore, ignored) prior. If we view "determinism" as underlying the uncertainty principle, we have changed philosophical "camps." As defined by Fred Alan Wolf, "Determinism is a philosophy that says what is depends on what was. What will be depends on what is. All are connected across time by laws of physics that allow one to determine what happens based on what happened, and what will be based on what is happening now." Chaos theory, which describes complex dynamical systems far from equilibrium, heralds the return from indeterminacy. The chaotic signature permeates nature. Processes can be extremely unpredictable, yet still deterministic. Our view of their future is always clouded. Chaotic systems have a high degree of unpredictability. The virtually mind-boggling notion we are left with is one of indeterminate-determinacy, or determinate-indeterminacy. Scientists are now contemplating the notion that chaotic dynamics may underlie the statistical probabilities of quantum flux (Gutzwiller, 1992). So, it is not a return to the cause-and-effect determinism of classical physics. Rather, it is a non-linear, always unpredictable, yet boundaried determinism. There may be a nonlinear mechanism to quantum physics. "Quantum Chaos" has been discovered in the distribution of energy levels of certain atomic systems, in their wave patterns, and when electrons scatter from small molecules. Chaos shows up in quantum scattering as variations in the amount of time the electron is temporarily caught inside the molecule during the scattering process (Gutzwiller, 1992). A new approach is being sought to reconcile the distribution of quantum mechanical energy levels with the chaotic orbits of classical mechanics. Chaos is at work in the wavelike nature of the quantum world, just as it is at work in classical chaos, and at the cosmological level in such phenomena as The Great Attractor, one of the largest known structures in the universe (see DISCOVER, Nov. 1989, p. 20). In chaos theory, all is determined by the initial conditions of the process. The whole process is extremely sensitive to those initial conditions and any subsequent perturbations, no matter how minor. Small errors in our initial descriptions quickly "pump up" into complex, compound errors in predictability. In the wildly fluctuating realm of subatomic activity, "probability is a measure of possibilities that must somehow exist simultaneously because these possibilities can effect, or overlap with, each other, thus changing the physical properties of matter" (Wolf, 1988). The apparently random phasing in and out of "points" in the universe displays a hidden order when we observe its dynamics. Humans live at the perceptible level of so-called classical or Newtonian mechanics. Quantum fluctuation, as expressed by the probability distribution, is normally very small and ignorable for an entity of our size. But when the dynamics is chaotic, these quantum fluctuations grow very large. One electron might, for example, fluctuate and initiate a change in brain waves, resulting in a phase shift or change in "state" of consciousness. Observation seems to change nothing more in the universe than the observer which becomes involved with it. By determining a specific "state" for the entity, a perturbation is created which has repercussions throughout the system, but also effects the "state" of the observer more than anything else. Parallel universes manifest whenever any observation takes place. They emerge because their presence is not forbidden by the mathematics; it is mandated. Just imagine the self-referential paradoxes which emerge when we observe ourselves! It is like an infinite hall of mirrors. And to compound the Mystery, both science and mysticism tell us that in the most essential ways we never observe anything but ourselves. Further, that self is apparently divine. For whatever the universe is, we are woven of that self-same fabric. How can we know the nature of ourselves and the universe(s)? How can we not? We are quantum creatures, as well as electrochemical biologies. Apparently all we need to do is look. Then the act of looking deterministically, yet non-linearly alters us infinitely, forever, and our universe as well. How can we "see through"; where is the "Doorway into Chaos" beyond the classical view? It comes with the suspension of "interpretations" of our experience. It comes with the suspension of the sense of separateness; suspension of disbelief in the reality of images. Science has been interpreting nature, like psychologists have interpreted dreams. This distances us from the immediacy of experience; it is a reaction to or against experience. It holds existential reality at bay. Our experience of the cosmos is essentially one of the experience of multi-dimensional (holographic) images. Even in the scientific view, matter is simply frozen light or energy. This fundamental energy also patterns our consciousness. We can observe this ongoing dynamic process as the stream of consciousness, with its concurrent imagery. This imagery manifests in our dreams and the "dream-wave" continues to manifest in our beliefs, thoughts, feelings, and behavior, which may also be viewed as imaginal phenomena. Dreams are an uninterpreted experience of that Great River of imaginal existence we call the Universe. To interpret dreams is to make the same mistake as to try to interpret nature. We come to "know" simply by being, looking, expressing, experiencing, experimenting. This very act leads to infinite transformation. But we do not remove ourselves from life to subjectively choose to look at one of our internal images, objectively. Instead, following nature's way, we immerse ourselves consciously, deliberately, in the on-going emergent process which is always there usually below the threshold of conscious awareness. This choice--to observe oneself--is a great experiment, perhaps the greatest science can devise. It yields direct, experiential evidence of the true nature of being, of reality. We do not experience an image, the image, or even images in general. We cannot experience an image, because we are constantly and unavoidably experiencing through them all the time. We do not perceive images, but through them. We are not distinctionally different from them. Ultimately, there is no concrete reality, only an infinite variety of virtual realities, vague fleeting dynamic images. Again, we are that; when we look at them, we look at ourselves. And like the cosmos, we find chaotic, dynamic multiplicity. Within that multiplicity we seek the unifying, creative, ordering principle, paradoxically finding its name is Chaos, its name is our Self, its name is Many, its name is Divine. The Heart of God is the heart of Chaos. With this philosophy, we suggest an experimental-experiential therapy, based on multiple experiences of multiple states of consciousness--immersion in the fluid flow of psychic imagery. Direct existential (multi-sensory) observation--with the suspension of interpretation--creates emergent transforma-tions of an organic nature, based on the unfolding of natural chaotic dynamics. Experience is inseparable from perception. Again, we do not experience perception through imagery, but perceive/experience directly our imaginal nature, which is not limited to the "rational" observation point of the ego, but consists of infinite multiple states of consciousness in chaotic, dynamic flux, within a field of multiple universes. In Gestalt and CCP we speak of "becoming" a symbol or image. But we can't become them, because we already are them. We realize our own essence through realizing the essence of dynamic imagery. It is the experience of multiple states of consciousness--a continuous transformation. This flux is undetermined (cloud-like, amorphous) until an observation is made, in which case it assumes a specific--perhaps bizarre--imaginal form or pattern, which is manifested as a gestalt experience. It happens spontaneously in dreams, visions, and parapsychological phenomena. It can be facilitated through experimental/experiential therapy. We can conceive of a sort of "fractal therapy" wherein we penetrate deeper and deeper into the self-iterating forms and patterns of our being, revealing and reflecting the essence of ourselves, our nature, and the nature of reality. There is "no point" in trying to predict just how we will change--what states we will experience--nor in interpreting that experience through corrupting models. What seems most therapeutic is simply "being there," with that multiple consciousness in its various forms, in that multiple universe of experiential possibilities. Because of the "observer effect", we cannot help but "become" the image as we observe it. If you don't believe it, try it and see for yourself. Note of Caution: you will be unpredictably changed by partaking in the process. There are an infinite number of mutually exclusive views about the universe. We call some sciences, others religions, or philosophies. We value them on a scale ranging from consensus agreement to idiosyncratic representations. More than one of these viewpoints can exist simultaneously in one brain. Physics tells us that the observer splits into two alter egos as a measurement with two alternatives is being carried out. Instead of measurement suddenly producing a single answer, the parallel worlds views says that each possible answer is produced in a parallel world. In psychology, a polarized ego experiences the Jekyll and Hyde split of the Shadow; an abused child evades further abuse by splitting into multiple egos, so the burden of dealing with the offender is shared among "the troops." There is some evidence that human personality, the ego state, undergoes multiple splits (fragmentation) if confined. Some "multiples" report detecting other "viewpoints"; others report only "blankness" between personalities. Even their pathologies, such as allergies, may vary between personalities. According to Jung, the personal unconscious is constellated around magnetic nodes called "complexes" which function like "strange attractors" at the core of stored traumatic experiences. They are natural structures within the psyche, and without them personality would have no individual expression. The collective unconscious also appears as multiple archetypes with characteristic styles of consciousness. These are the transpersonal forms, including shadow, anima/animus, and images of the Self, such as animal totems, magicians, healers, angels, and wise ones. Their many forms constitute the "Thou" of the "I-Thou" dialogue. The imagery of the unfolding self is generally considered prognosticative of our future states--it reveals what we may expect to potentially unfold over time. The "quantum unconscious" appears as clouds, time fogs, waves, spirals, black holes, tunnels into other dimensions, full and empty voids. The cloud or fog of time is parallel universes--the hologram of parallel universes. Beyond the realm of personified archetypes and mythic beings, it is non-dialogical, purely existential experience of raw energy transforms. In physics, black holes mean both the death and the birth of matter, simultaneously. They mean the same thing for consciousness in the journeys. Wolf intimates that given the right circumstances it is possible to witness other worlds by somehow tuning in to our own electrons. If we could enter an electron, we might see just the kinds of things that might be seen when entering a spinning black hole as predicted to exist by general relativity. Then our bodies would themselves be "time machines." Only stagnant or nonrotating black holes rip everything apart. Entering them leads to images of dismemberment, dissolution, annihilation--ego death. In the consciousness journeys, participants report unusual blackness--black blacker than black--which they describe as doorways to other dimensions. Sometimes they actually refer to them spontaneously as being like black holes. Mystics refer to the Abyss of the Transcendent Imagination, and suggest one have a guide for travel in that realm. One of the most interesting implications of the parallel universes model (multistate paradigm) is that it becomes, in principle, possible to violate the Uncertainty Principle simply by talking to yourself in the future! Mystics have reported this conversational (dialogical) experience over the aeons under various names--the genius, the daemon, Mercurius, the Holy Guardian Angel, the Higher Self, the radiant form of the Guru. In the parallel universes theory, there is no absolute past, because there is always the possibility at any time that some present event will alter it (Wolf, 1988). Paradoxically the future communicates with the present--all possible futures act on the present. If time is a "river" it contains two counterstreaming currents. Past and future influence the present. Wolf notes that, "the tiny quantum, through the reality of the quantum wave of probability and its behavior in spacetime, already implies that information can flow from past to present and from future to present. Thus it implies the existence of both the past and the future 'simultaneously' with our own time." In terms of physics, a complex conjugate wave travels back through time, meeting the original wave, modulating it in the process--transforming the present through a transaction. Every observation--including those of consciously observing self--sends out a wave toward both future and past. Both the beginning of the wave and end appear to begin in our mind--our mind in the future and our mind in the present. This bears on the emergence of creativity and intuition. Wolf says that, "the past, present, and future exist side-by-side. If we were totally able to 'marry' corresponding time each and every moment of our time-bound existences, there would indeed be no sense of time and we would all realize the timeless state, which is taken to be our true or base state of reality by many spiritual practices." It appears that time and mind are connected, and that the arising of order and evolution in the universe may come from the future, since information flows from past to present and from future to present. Quantum chaos and consciousness are the hidden variables which condition reality. We can conceive of a new kind of "path-ology," a path that twists through spacetime and somehow arrives back on itself--after traveling through time--at the same time it left. Thus, consciousness continually reports from the "front"--and conditions the present--through the flow of inherent dynamic imagery. By choosing to observe/participate in this process we embrace the chaos and open ourselves to its natural transformative influence. It is "recycling" of consciousness. We can conclude that the quantum wave function is a real wave which exists in all of the parallel worlds simultaneously. It never stops propagating from the past and future. Where waves coincide, events occur; something physical appears. And there is also something else--intelligence, order, and consciousness. Wolf imagines consciousness as the resonant gathering of simultaneously present quantum waves--clashing waves of time--one coming from the future and one from the past, defining the present. Mind emerges as the focal point of these waves. He asserts that, "There is associated with every appearance of a physical object a site of knowledge. When these sites of knowledge are grouped together in a tight region of space alone, we have consciousness." He goes on to state that, "Knowledge or mind is then the relationship of future to past--that relationship appearing as, and creative of, the present moment. Knowledge is thus equivalent to meaning, and meaning is only present when there are two events--a future and a past," recognized by emergent mind. Classical determinism is determined by the past alone; chaotic determinism is non-linear and determined by past/future. All parallel universes are real, but not all exist. We can tune in to multiple, virtual realities, passing across time barriers, sensing the future, and reappraising the past. In consciousness journeys we partake of the infinite possibilities of transformative imagery and existentially realize ourselves. We view the cosmic hologram, and in so doing determine one of its myriad forms. What we see depends on the viewpoint we take. That viewpoint alters the hologram because it alters the probabilities by moving in time. Thus the human mind is the alchemical laboratory of consciousness and new physics. It is already tuned in to the past and the future, making existential certainties our of probable realities. According to Wolf and the multistate paradigm, it does this "by simply observing. Observing oneself in a dream. Observing oneself in this world when awake. Observing the action of observing." Bearden, Thomas, EXCALIBUR BRIEFING, Strawberry Hill Press, San Francisco, 1988. DeWitt, Bryce S. and Grahm, Neill. THE MANY WORLDS INTERPRETATION OF QUANTUM MECHANICS. Princeton, New Jersey: Princeton University Press, 1973. Gutzwiller, Martin C., "Quantum Chaos," SCIENTIFIC AMERICAN, Jan. 1992, pp. 78-84. Penrose, Roger, "Quantum Physics and Conscious Thought," QUANTUM IMPLICATIONS, Hiley & Peat, Eds. Routledge & Kegan Paul, London and New York, 1987. Progoff, Ira, THE CLOUD OF UNKNOWING, Dell, New York, 1957, 1983. Tart, Charles T., STATES OF CONSCIOUSNESS, E.P. Dutton & Co., Inc., New York, 1975. Vogel, Shawna, "Star Attraction," DISCOVER, Nov. 1989, pp. 20-22. Wolf, Fred Alan, PARALLEL UNIVERSES, Simon & Schuster, New York, 1988.